We will have a club enclosure at this event, I don't expect everyone to book with them yet, but it would be nice to know who is thinking of coming along. So please add your name to this thread if you are coming. 2) Select "Motorhomer" from the drop-down club box. 3) Enter your Member ID in the box title "Number". You can find your Member ID by clicking in your username on the top bar (just to the left of inbox). 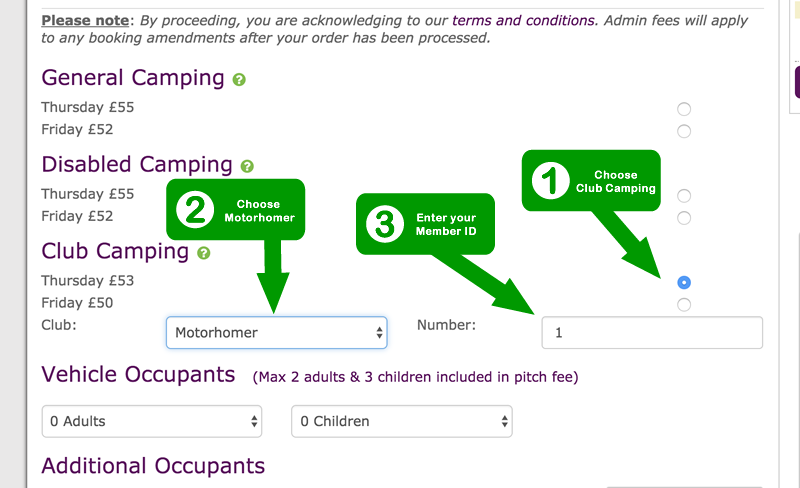 Does it make any difference between selecting "Campervan" or "Motorhome"? Are the Pitch sizes the same between "Club Camping" and "General Camping"? I do not believe so, it won't change the price or the pitch. Club Camping Pitches are 10m x 8m with a 5m roadway, general camping pitches are most likely the same. We plan to attend. Went last year and it was very entertaining. The advantage of being on a club pitch rather than general is that it’s nearer to the stands and entertainment. From the general camping area it can be a 20 minute walk each way. I had never realised how many motorhomes there are before attending this. They definitely check your guns on entering the evening entertainment, you have to show the cylinder is empty - they’re not allowed to touch it! It’s quite a novel experience. Anybody else thinking of attending this rally? Put me down as a possible maybe please Phil. Is there a deadline for booking the site Phil please, I am very interested Thanks.